Available in 3 versions, the petrol or diesel Q7, the hybrid electric Q7 e-tron and the sportier SQ7 version, there’s something for everyone in this range. Being in a category that’s known for being highly competitive from other German and British rival car makers the Q5 can hold its head up high in terms of performance, ride and value. Two trims are available the SE and the higher spec S Line. Each equally equipped however the Audi Q5 continues to be the company flagship for all things technical. Being lighter than its predecessor means agility has improved which makes for a smoother ride. Options include adaptive air suspension which makes the ride as smooth as can get. The steering gives plenty of feel back to let you know what’s going on, making the ride comfortable yet never vanilla. The suspension, drive and steering are all customisable via the Audi Drive Select modes. The Quattro drive system is easily capable of guiding the car round muddy fields or tracks. Helped by a quiet cabin so you can concentrate on the job in hand. 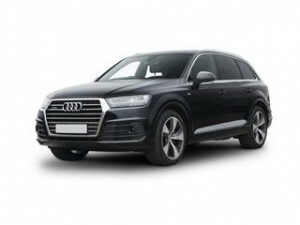 The 3 Litre TDI Diesel can reach speeds of 62mph in under 6.5 seconds making the Audi Q7 no slouch. Coast2CoastCars have access to the latest dealers on all list price Q7 models through our network of UK nationwide Audi dealers. See how much you could save today via our online quote service, all free of charge.